These 16 meds are actually safe for your pupper. Any dog owner will tell you that a dog getting sick is the absolute worst. Not only can they not tell you what hurts, but getting meds to treat your pooch can mean an expensive trip to the veterinarian. Or does it? It turns out, according to veterinarians, a number of over-the-counter (OTC) medications can be used to treat your canine BFF. If you know how to safely administer them, that is. In fact, the exact same meds you use for everything from skin conditions and joint pain to upset tummies and allergies can often be used for your dog, too. For instance, did you know dogs can have allergies? I sure didn’t, but your dog can be allergic to pollen, household cleaning items, insect bites, and even their food. 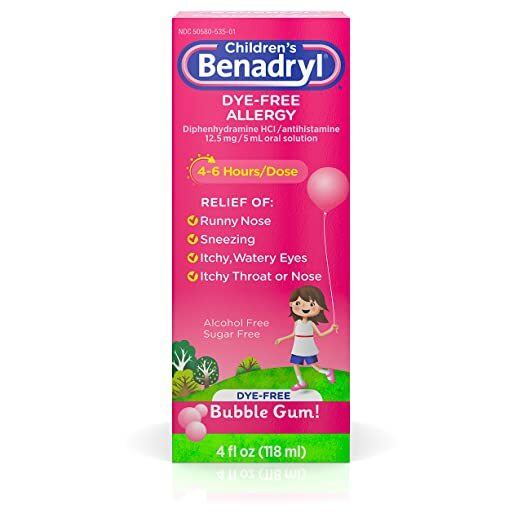 The good news is that your dog's allergies can likely be treated with OTC Benadryl you can buy at any pharmacy or online retailers. The same goes for upset dog tummies, which you can treat with some of the same antacids you rely on for heartburn and acid reflux. Itchy skin rashes can also be soothed with hydrocortisone or anti-fungal creams designed for humans. You probably already have many of these dog-safe medications in your cabinet, and they can save you a ton of money on vet bills and special prescription pet meds. If you don’t already have everything on this list, you can set up your own dog-friendly pharmacy for less than $120. It’s important to note that while some medications designed for humans are perfectly safe for your canine BFF, others are downright dangerous, so you need to know which meds are puppy-safe and where to find them. If you have questions about what medications you can safely give your dog, how to dose your pooch with “people medicine," and how to safely and easily administer meds to your fur baby, it’s always a good idea to consult a veterinarian. We recommend doing so before trying any medications, in fact. Be sure to ask them which medications are right for your dog and which people meds are poisonous for dogs. Read on for more information about how to keep your pup healthy and happy with these easy-to-find, inexpensive remedies recommended by veterinarians. 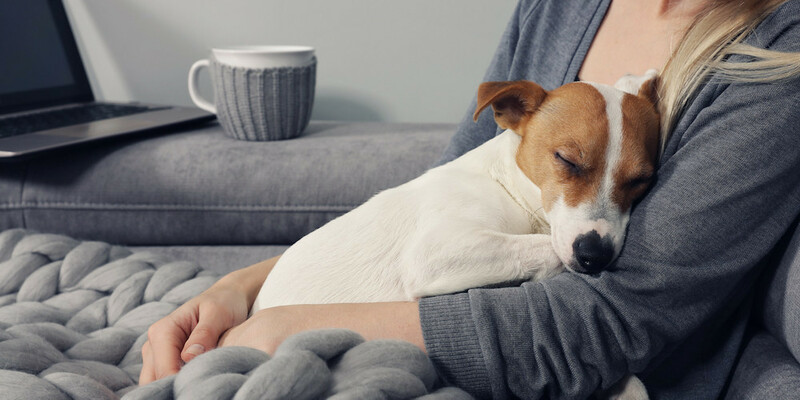 If you have a dog, you should bookmark this page to keep track of the list of medications for people that you can actually give their dogs when they feel under the weather. As veterinarian Dr. Robert Silver, DVM, wrote for Bark.com, like their human parents, your dog can have allergies to everything from pollen and dust mites to foods they eat. Often, dog allergies will manifest as itchy skin rashes. According to Silver, pruritus – or the clinical name for this allergy rash – is the second most common reason people take their dog to the vet, which can end up being seriously expensive. Fortunately for fur babies with allergies, the American Kennel Club (AKC) notes that OTC antihistamines like Children’s Dye-Free Benadryl (diphenhydramine) can safely be used to treat your dog’s allergy symptoms and save you a trip to the vet for mild irritation. The same website notes that the appropriate dose of Benadryl for your dog is two to four milligrams per kilogram (2.2 pounds) of body weight — which means a milligram per pound. Since most drug store Benadryl is sold in 25 milligram pills, a 25-pound dog will need one pill every two to three hours. For dogs that weigh less than 25 pounds, they recommend using a liquid children’s formula like Children’s Dye-Free Benadryl, priced at just $5.42 for a 4 ounce bottle. As an added bonus, since this medicine can make your dog sleepy, it can also be used to help with doggy insomnia or travel-related anxiety. If your dog has a tummy ache, antacids like Pepcid AC (famotidine) can help, according to Dr. Patty Khuly of vetstreet.com. While you should always consult your vet if your dog vomits (especially if they consumed something potentially harmful), an OTC antacid like Pepcid AC ($9.50, 30 count, 10 mg tablets) might give them some relief. 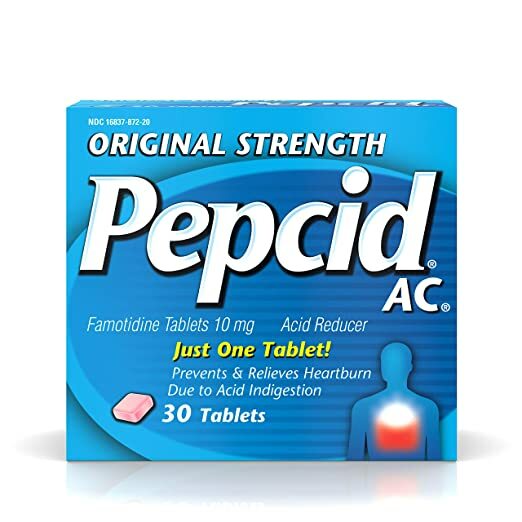 AKC Chief Veterinary Officer Dr. Jerry Klein, DVM, PhD notes it’s important to get the original strength 10 mg of Pepcid AC for your dog, as other formulas might include additional medications that aren’t dog-safe or could be too strong for your pup. He adds that for maximum effectiveness, you should give it to your dog on an empty stomach and not with a treat or meal, as food can interfere with this med. Instead, to give your dog a pill with ease, place it in the back of their mouth, gently close it with your hands, and blow on their face to encourage them to swallow, Klein says. 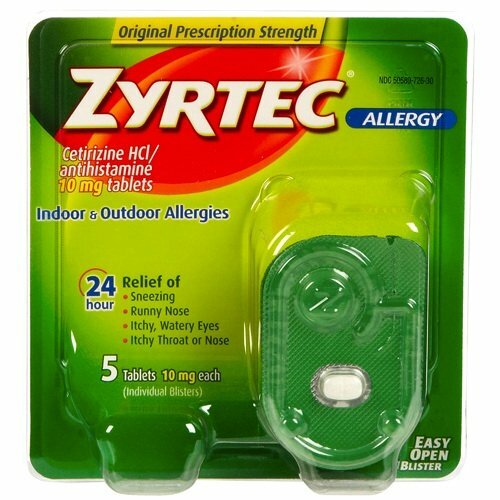 If your dog suffers from seasonal allergies (causing symptoms like sneezing, watery eyes, and itchy skin in the spring and fall), Lynn Buzhardt, DVM at VCA Hospitals recommends a daily antihistamine like Zyrtec ($6.79 for five 10 mg tablets), which is generally considered safe for dogs. She adds it's important to read the label to make sure the Zyrtec (cetirizine) formula you choose doesn’t also contain a decongestant like pseudoephedrine, or a sweetener called xylitol as they are NOT safe for your canine. 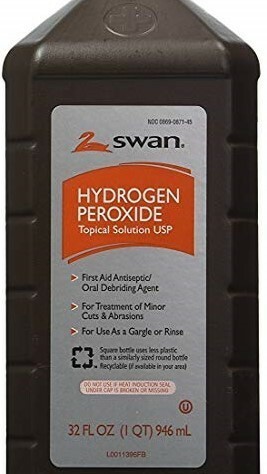 According to Buzhardt, a three percent hydrogen peroxide solution like Swan Hydrogen Peroxide Antiseptic Solution is a must-have for dog owners. You can use peroxide to disinfect wounds on your pooch’s skin and it can be used to induce vomiting if your pup digs into a food that's dangerous for dogs, like chocolate or raisins. At just $6.79 for a 32 ounce bottle, this multipurpose antiseptic is definitely worth stocking up on if you have a dog in your life. 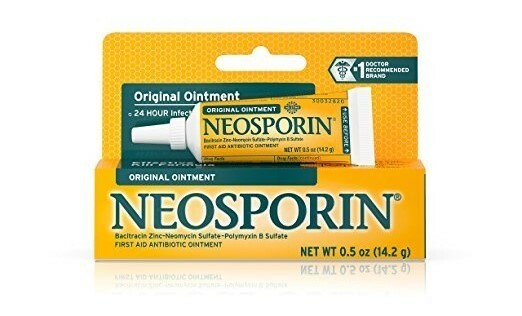 According to Khuly, a topical antibiotic ointment like Neosporin Original Antibiotic Ointment (containing neomycin sulfate, bacitracin zinc, and polymyxin B), which is just $3.97 on Amazon, can help your dog’s minor scrapes and scratches heal faster and prevent them from getting infected. She notes antibiotic ointments should only be used on mild cuts, and not if your dog is prone to licking that area as it can give them an upset tummy. 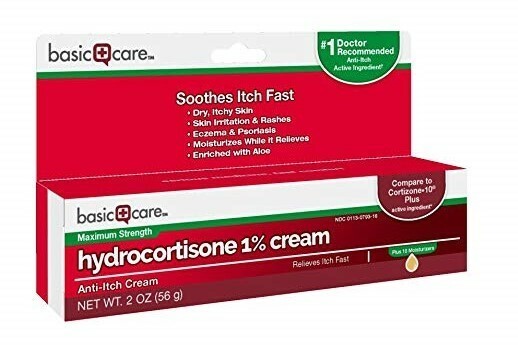 All dogs love to scratch, but if your dog has itchy skin from insect bites or hot spots due to irritation from fleas, allergic rashes, or too much scratching, a mild OTC steroid cream like Basic Care Hydrocortisone 1% Cream ($4.27 for a 2 ounce tube) can help stop their itch, says Buzhardt. She notes steroids can cause the unfortunate side effect of slowing the healing process, so if your dog’s skin doesn’t heal in a few days, you may need to discontinue use and call your vet to make sure the wound isn’t infected. There’s pretty much nothing worse than a dog with diarrhea. Nothing. According to VCA hospitals, Pepto-Bismol (Bismuth Subsalicylate) can be used to treat your dog’s loose stools or tummy troubles. 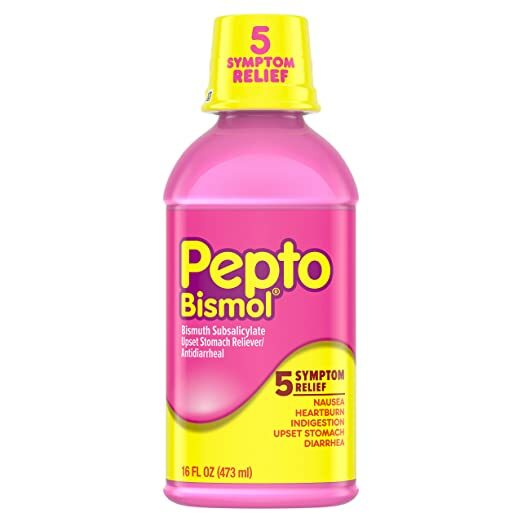 Priced at $6.38 for a 16-ounce bottle, Pepto-Bismol works by coating the stomach to provide relief from (as the company's jingle goes), nausea, heartburn, indigestion, upset stomach, and yes, diarrhea. You can give your dog one teaspoon of Pepto-Bismol per five to 10 pounds of body weight and should call the vet if they can’t keep it down or diarrhea continues. 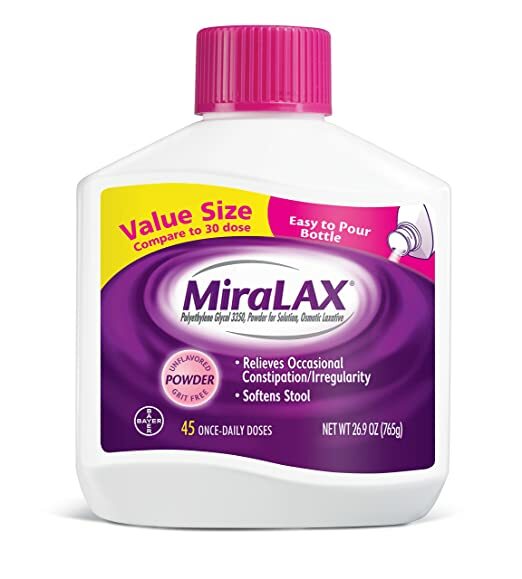 If your dog is constipated, Dr. Cathy Meeks told petmd.com that MiraLAX Laxative Powder ($22.74 for a 26.9 ounce bottle) is a safe laxative you can use to treat them. She notes you definitely want to consult your veterinarian about how much MiraLAX to give your dog, as too much can give them diarrhea, and that would be the worst thing ever. If their constipation doesn’t resolve in a few days, take them to the vet to rule out something serious. VCA Hospitals notes eye drops like Artificial Tears Lubricant Eye Drops are a must-have for your pet-safe medicine cabinet. 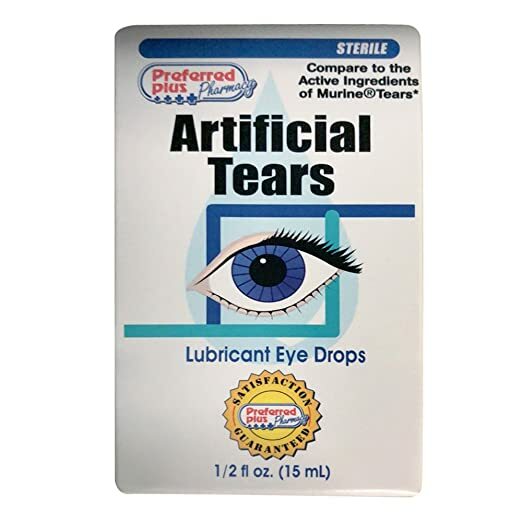 They can be used to soothe dry eyes and mild conjunctivitis, and are relatively inexpensive at $5.99 — especially when compared to the cost of a trip to the vet. As your dog gets older, they might suffer from arthritis. 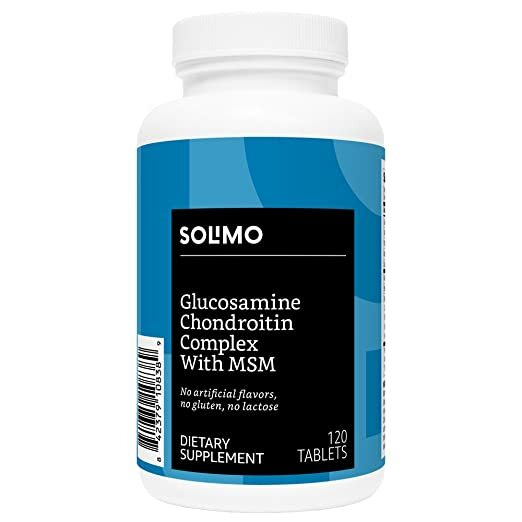 To ease their aching joints, Meeks recommends a Glucosamine Chondroitin supplement like Amazon Brand - Solimo Glucosamine Chondroitin Complex ($12.49 for 120 tablets), which have been proven to help relieve pain from osteoarthritis. 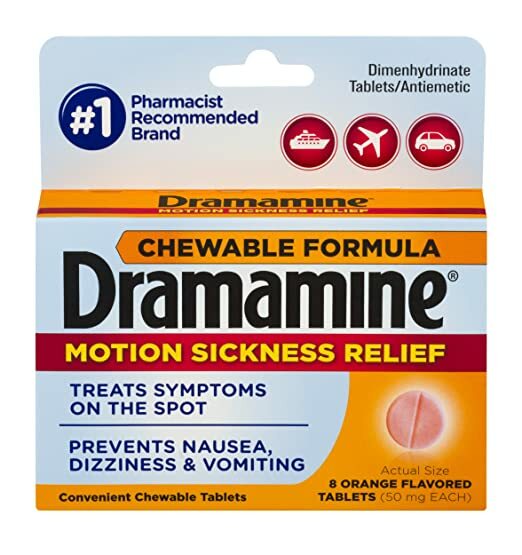 If you plan to take your dog on a road trip, Meeks notes OTC motion sickness meds like Dramamine Motion Sickness Relief Chewable Tablets can help prevent your dog (and you) from getting car sick. Priced at $4.13 for an eight-count package, they're an affordable addition for your stock of pet-safe medications. She adds dog owners should be aware this medication can make your pupper drowsy and that you should consult your vet for dosing information. Another safe medication to treat the dreaded dog diarrhea is Immodium A-D (loperamide hydrochloride), according to Klein. 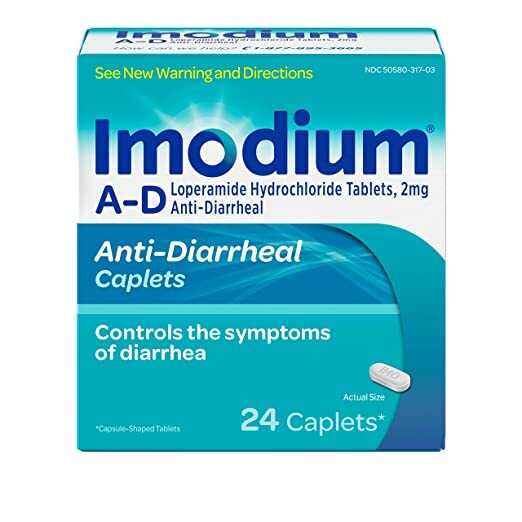 They recommend a dose of two milligrams per 40 pounds of body weight two to three times a day, which means a 24 tablet bottle of Immodium A-D ($9.47) should hopefully last a long time. You can give it to your dog in a “pill pocket” designed for dog medicines, or wrap it in a bit of cheese to hide the taste. Khuly notes that meds like Bayer Aspirin are some of the only safe OTC options to treat pain in dogs.The proper dosage for aspirin in dogs is 10 to 40 milligrams per kilogram (about two pounds) of body weight, according to the AKC. You can always call your vet if you have questions about how much to give your dog. Khuly adds aspirin should never be used with other non-steroid, anti-inflammatory drugs (NSAIDs), and may give your dog an upset tummy if used too frequently or on an empty stomach.The American Veterinary Medicine Association warns pet owners that other common household pain relievers like ibuprofen and acetaminophen should never be given to dogs, as they can be deadly. 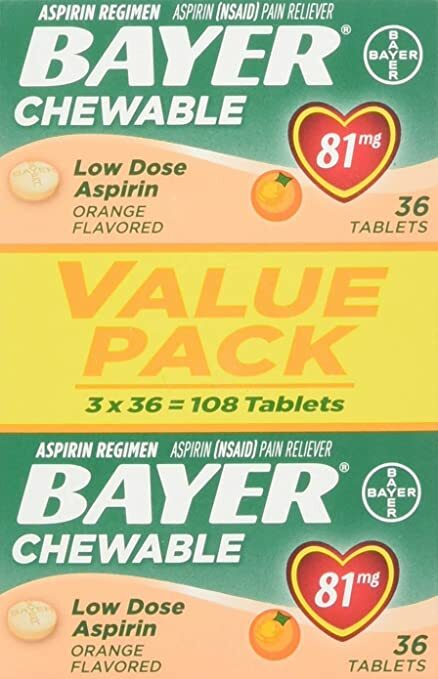 Aspirin remains one of the only pain medications available to treat your dog’s pain affordably (just $6.36 for 108 tablets) without a prescription or costly visit to the vet. 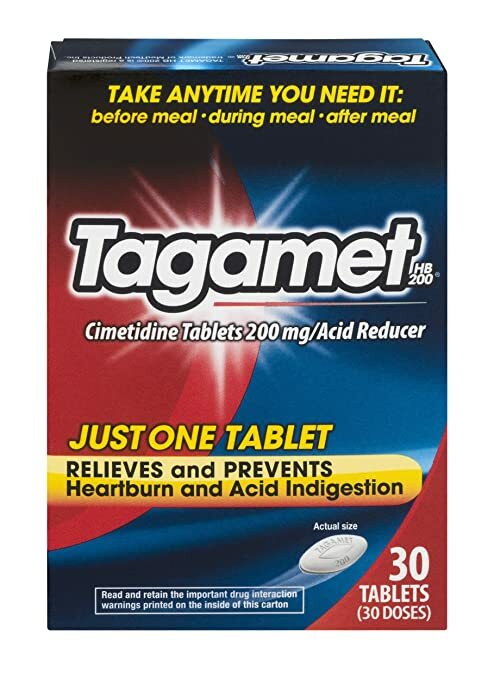 If your dog has a tummy ache, another affordable option that’s available over the counter is Tagamet Acid Reducer (Cimetidine). It works by blocking acid in your pup’s stomach, and you can add this dog-safe medication to your pet care medicine box for just $5.36 per nine tablets. Dr. Khuly notes minor fungal skin infections like ringworm and yeast infections sometimes don’t require a trip to the vet for treatment. Instead, you can try an OTC remedy like Miconazole Nitrate Antifungal Cream to treat their skin infection. It's priced at $6.49 for a one ounce tube. If their condition seems to get worse or doesn’t get better after a week of treatment, she suggests calling your vet to see if prescription strength cream or an office visit is necessary. 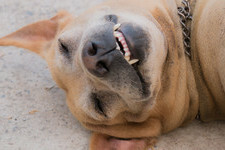 For joint health and healthy skin and coats, Dr. Randy Kidd, DVM, PhD, a holistic veterinarian at petmd.com suggests adding an omega 3 fatty acid nutritional supplement like Nature's Bounty Fish Oil to your dog’s diet. For easy administration, you can simply cut the capsules and add the oil to your dog’s food. They'll love the fishy taste and you’ll love the price tag – just $8.61 for a 200 count package. 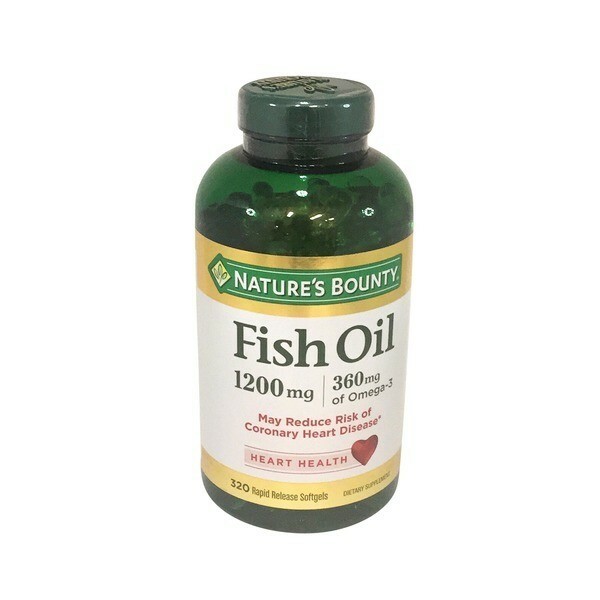 Kidd adds there are very few negative side effects to adding fish oil to your pooch’s pet dish, so you have nothing to lose and a healthier dog to gain. We hope you love these products! So you know, It's Rosy may collect a share of sales from the links on this page.